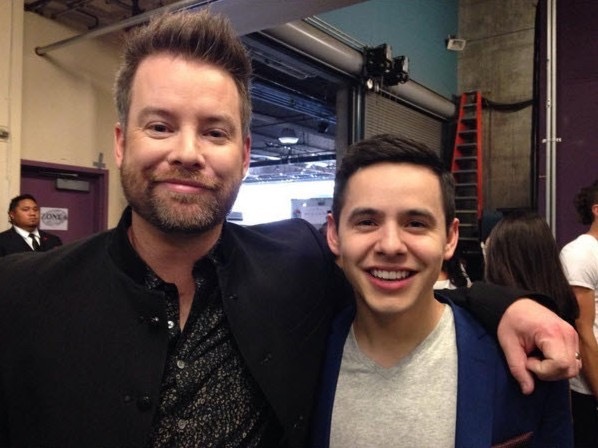 Like many of you, I was so disappointed that David Archuleta was not added as a featured performer during the American Idol Finale last week. Arguably, he was one of the greatest American Idol finds and that gentleman standing next to him in the above photo – David Cook – shares this unique position in my personal opinion. “Hey y’all, I know a lot of you were bummed I didn’t sing in the idol finale and asked why I didn’t sing. It wasn’t that I didn’t want to. I’m way bummed I wasn’t able to be more a part of it!! 😦 😦 😦 but it wasn’t because they wouldn’t let me. It was simply that I thought I wouldn’t be able to until a few days before. I’m glad I was able to be there and still be on stage for a moment with everyone. We sometimes wish things would have gone differently, but life doesn’t always go the way we hope it to at first. I’m so glad I could be there! I was reminded of the stressful and overwhelming moments that broke me down a lot of times, but also of the many good people that helped me get back up. I was reminded of the moments that changed my life on the show. I’m glad I got to be a part of it all throughout the years. I’ll write a blog in the next couple of days to share more thoughts with y’all. I will say not being stressed and having so much attention, I was able to enjoy the time backstage saying bye to everyone and meeting the people that worked behind the scenes. I love meeting the people who are also a part of the show in both big ways and small ways that no one else ever sees or hears about. Thank you all for your concerns. Yeah, I am sad I didn’t sing but also happy I was there. Really, if I had sung I would’ve taken someone else’s spot and I think it worked out how it needed to. Someone else needed to give out what was in their heart this time. It was Trent and La’Porsha’s time to shine most anyway. (And boy, did they shine. What a great final finale!) No worries, I will keep finding ways to sing up ahead as long as y’all keep supporting. Thank you for your continued support and concern! It’s nice to know people still care enough to ask”. So, in other words, David humbly relinquished his spot so that others – particularly the Final 2 of Season 15, Trent Harmon and La’Porsha Renae– could have more time on stage. I love him even more for doing this – as if I need more reasons to love him. What a special young man and even greater role model to everyone, young and old. However, could someone explain to me why Jennifer Lopez dominated the stage with a number that lasted about 7 minutes or so? Seriously? Does she really need this exposure? We tuned into the show to watch the Idols – not her. I am sure she would have continued to sell her CDs and pack her shows or whatever without grabbing the limelight away from the Season 15 Top 10. Or from someone as talented as David Archuleta who, by the way, can sing circles around her. End of rant. More to come. Stay tuned. Comments are now open for business. JLo’s fiasco was a train wreck! I loved seeing all of the past idols, but felt that it cheated this seasons contestants from their season finale, as well as Trent and La P; add that to the fact these kids did not get a “fair” full season, a tour, all the perks the previous seasons got, makes you see why it all came crashing down! I do not believe for one minute that idol went out on top, like the producers said it did. Did you notice Brooke White’s IG post at her sadness at not being invited back? I really felt for her! I would also like to add how impressed I was with the performances of the past Idol’s Jessica Sanchez, Carly Smithson and Melinda Doolittle in particular. Janey – no I missed Brooke’s IG comments. But, I am not surprised. That show was thrown together. Nothing made sense. Nothing. Perfectly said. I stopped watching AI a long time ago but tuned in to see David A.
on stage for her. But to not even invite her? Doesn’t make sense. I was especially annoyed by the length of time given to the current judges’ performances, but especially former judge Kara. I thought Trent and La’Porsha should have been featured more. And all of this year’s contestants should have had at least a group song. Who they invited to take part and who they didn’t seems to have been completely random–which sort of matched the finale production, so. 😉 They could have just as well asked Brooke and Jason Castro and really ALL the other contestants, it’s not like they featured most of the alumni on the stage anyway. Besides, quite a few would have been too busy to come anyway, so the producers would have made so many fans happier AND been more appreciative of the people who made the show what it was, all without significant cost to themselves. ReReader – my thoughts exactly. If Jason Castro on the Red Carpet, why couldn’t he be on stage? It is so silly really. Or, perhaps singers from each season could have performed a group number to highlight their season. How cool would that have been? As we’ve been saying all along, MCL, the AI team SO should have hired you! MCL, if memory serves, Jason had another gig that night with The Castro Band. He was in the audience the night before the finale with his daughter and sister. janey79–You are correct, Jason had a public gig in Castro (the band) the night before the red carpet, and a corporate gig the night of the finale, and he did get tickets for himself and his daughter for the night of the final performances (it took a while for that to happen, according to his mom). But he was never asked to appear in the finale, according to his tweets, so we’ll never know if the scheduling could have been worked out or not. As I said above, I’m sure quite a few of them wouldn’t have been able to come, so it would have been all to AI’s advantage to ask all its alumni–at least the top 10 of each season–to come. I just watched it (out of town) and was wondering – was Kelly Pickler (sp?) there? I’m pretty sure I saw Kellie Pickler in a couple of the group numbers.